The Ganges-Brahmaputra Delta (also known as the Brahmaputra Delta, the Sundarbans Delta or the Bengal Delta) is a river delta in the Bengal region of the Indian subcontinent, consisting of Bangladesh and the Indian state of West Bengal. It is the world's largest delta and empties into the Bay of Bengal the combined waters of several river systems, mainly those of the Brahmaputra river and the Ganges river. It is also one of the most fertile regions in the world, thus earning the nickname the Green Delta. The delta stretches from the Hooghly River east as far as the Meghna River. The Ganges Delta has the shape of a triangle and is considered to be an "arcuate" (arc-shaped) delta. It covers more than 105,000 km2 (41,000 sq mi), and although the delta lies mostly in Bangladesh and India, rivers from Bhutan, Tibet, India, and Nepal drain into it from the north. Approximately 60% of the delta is in Bangladesh and, 40% in West Bengal, India. Most of the delta is composed of alluvial soils made up by small sediment particles that finally settle down as river currents slow down in the estuary. Rivers carry these fine particles with them, even from their sources at glaciers as fluvio-glacial. Red and red-yellow laterite soils are found as one heads farther east. The soil has large amounts of minerals and nutrients, which is good for agriculture. It is composed of a labyrinth of channels, swamps, lakes, and flood plain sediments (chars). 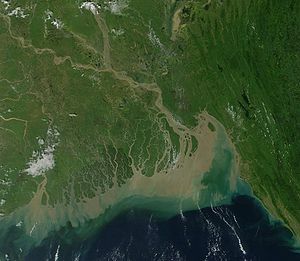 The Gorai-Madhumati River, one of the distributaries of the Ganges, divides the Ganges Delta into two parts: the geologically young, active, eastern delta, and the older, less active, western delta. Between 125 and 143 million people live on the delta, despite risks from floods caused by monsoons, heavy runoff from the melting snows of the Himalayas, and North Indian Ocean tropical cyclones. A large part of the nation of Bangladesh lies in the Ganges Delta, and many of the country's people depend on the delta for survival. Three terrestrial ecoregions cover the delta. The Lower Gangetic plains moist deciduous forests ecoregion covers most of the delta region, although the forests have mostly been cleared for agriculture and only small enclaves remain. Thick stands of tall grass, known as canebrakes, grow in wetter areas. The Sundarbans freshwater swamp forests ecoregion lies closer to the Bay of Bengal; this ecoregion is flooded with slightly brackish water during the dry season, and fresh water during the monsoon season. These forests, too, have been almost completely converted to intensive agriculture, with only 130 square kilometres (50 sq mi) of the ecoregion's 14,600 square kilometres (5,600 sq mi) protected. Where the delta meets the Bay of Bengal, Sundarbans mangroves form the world's largest mangrove ecoregion, covering an area of 20,400 square kilometres (7,900 sq mi) in a chain of 54 islands. They derive their name from the predominant mangrove species, Heritiera fomes, which are known locally as sundri or sundari. Animals in the delta include the Indian python (Python molurus), clouded leopard (Neofelis nebulosa), Indian elephant (Elephas maximus indicus) and crocodiles, which live in the Sundarbans. Approximately 1,020 endangered Bengal tigers (Panthera tigris tigris) are believed to inhabit the Sundarbans. The Ganges–Brahmaputra basin has tropical deciduous forests that yield valuable timber: sal, teak, and peepal trees are found in these areas. The delta region has mangrove trees. Trees found in the delta include sundari, garjan (Rhizophora spp. ), bamboo, mangrove palm (Nypa fruticans), and mangrove date palm (Phoenix paludosa). Many endangered species live here. The Ganges Delta lies at the junction of three tectonic plates: the Indian Plate, the Eurasian Plate, and the Burma Plate. The edge of the Eocene paleoshelf runs approximately from Kolkata to the edge of the Shillong Plateau. The edge of the paleoshelf marks the transition from the thick continental crust in the northwest to the thin continental or oceanic crust in the southeast. The enormous sediment supply from the Himalayan collision has extended the delta about 400 kilometres (250 mi) seaward since the Eocene. The sediment thickness southeast of the edge of the paleoshelf beneath the Ganges Delta can exceed 16 km (10 miles). In recent years,[when?] scientists have been helping the poor people of the delta to improve fish farming methods. By turning unused ponds into viable fish farms, and improving methods of raising fish in existing ponds, many people can now earn a living raising and selling fish. Using new systems, fish production in existing ponds has increased 800%. Shrimp are farmed in containers or cages that are submerged in open water. Most are exported. Arsenic is a naturally occurring substance in the Ganga Delta that has detrimental affects on health, and may enter the food chain, especially in key crops such as rice. The Ganges Delta lies mostly in the tropical wet climate zone, and receives between 1,500 to 2,000 mm (59 to 79 in) of rainfall each year in the western part, and 2,000 to 3,000 mm (79 to 118 in) in the eastern part.. Hot, dry summers and cool, dry winters make the climate suitable for agriculture. In November 1970, the deadliest tropical cyclone of the twentieth century hit the Ganges Delta region. The 1970 Bhola cyclone killed 500,000 people (official death toll), with another 100,000 missing. The Guinness Book of World Records estimated the total loss of human life from the Bhola cyclone at 1,000,000. Another cyclone hit the delta in 1991, killing about 139,000 people. One of the greatest challenges people living on the Ganges Delta may face in coming years is the threat of rising sea levels caused by climate change. An increase in sea level of 0.5 metres (1 ft 8 in) could result in six million people losing their homes in Bangladesh. Important gas reserves have been discovered in the delta, such as in the Titas and Bakhrabad gas fields. Several major oil companies have invested in exploration of the Ganges Delta region. ^ Merriam-Webster 1997, p. 412. ^ a b Chowdhury, Sifatul Quader; Hassan, M Qumrul (2012). "Bengal Delta". In Islam, Sirajul; Jamal, Ahmed A. (eds.). Banglapedia: National Encyclopedia of Bangladesh (Second ed.). Asiatic Society of Bangladesh. ^ a b Bowden 2003, p. 39: "Many of [Bangladesh's] people depend on the delta for their survival. Two-thirds of Bangladeshis work in agriculture and grow crops on the fertile delta floodplains. Jute fiber, used to make twine and sacking, is Bangladeh's main export crop. Tea, wheat, rice, beans, sugarcane, and fruits are grown." ^ "Tectonics & Geophysics". BanglaPIRE. Retrieved 13 June 2017. The Ganges Brahmaputra Delta lies at the junction of three plates: the Indian Plate, the Eurasian Plate and the Burma Platelet. ^ Steckler, Michael S.; Humayun, S. Akhter; Seeber, Leonardo (15 September 2008). "Collision of the Ganges-Brahmaputra Delta with the Burma Arc". Earth and Planetary Science Letters. Elsevier. 273 (3–4). doi:10.1016/j.epsl.2008.07.009. Retrieved 22 April 2013. The edge of the pre-delta Eocene paleoshelf is marked by the shallow-water Sylhet Limestone, which runs NNE from near Calcutta to the edge of the Shillong Plateau ... The Sylhet Limestone drops ... indicating the presence of thick continental crust. East of the hinge zone the great thickness of sediments indicates that the crust is greatly thinned or oceanic ... The enormous supply of sediments provided by the Himalayan collision fed the [Ganges-Brahmaputra Delta (GBD)] and has produced ~400 km of progradation of the shelf edge since the Eocene ... Total sediment thickness beneath the GBD southeast of the hinge zone exceeds 16 km. ^ a b Bowden 2003, p. 44: "Fishing has played a part in the lives of Bangladeshi people for a long time ... Fish is particularly important in Bangladesh, where it provides the main source of protein in the diet of many people ... Shrimp are farmed in large containers or cages that are submerged in the open water. They are mainly sold for export." ^ "Global Demand for Fish Rising—Fish Farming is the Fastest Growing Field of Agriculture". Future Harvest. Archived from the original on 5 October 2006. In Bangladesh, scientists are turning unused ponds into viable fish farms and improving fish raising in the existing ones. The project has led to a new way for the rural poor to earn an income ... Using new systems developed through research, fish production in existing ponds has increased eightfold. ^ "History and Society/Disasters/Cyclone Deaths". Guinness World Records. Archived from the original on 19 November 2005. Retrieved 12 July 2013. ^ Bowden 2003, p. 43: "In 1970 Bangladesh suffered the world's worst recorded cyclone, when about 500,000 people were killed. The last bad cyclone to strike Bangladesh was in 1991. It killed 139,000 people." ^ Bowden 2003, p. 40: "In 1998 ... About one thousand people were killed, and more than 30 million were left homeless by floods ... The entire rice crop was ruined, and the government asked for almost $900 million dollars of aid to help it feed and rehouse its people." ^ Bowden 2003, p. 44-45: "The greatest change Bangladesh and its people may face in the coming years will probably be the threat of global warming ... One of the likely results of global warming is a gradual rise in sea levels. This could be 1.6 feet (.5 meters) by 2100. That might not sound like very much, but it would mean that 6 million Bangladeshis would lose their homes." ^ USGS-Bangladesh Gas Assessment Team (2001). U.S. Geological Survey—PetroBangla Cooperative Assessment of Undiscovered Natural Gas Resources of Bangladesh. DIANE Publishing. ISBN 978-1428917972. ^ Bowden 2003, p. 41: "Gas reserves ... lie under the delta region and offshore in the Bay of Bengal. Important discoveries were made during the 1990s, and several major oil companies have invested in gas exploration in Bangladesh." Merriam-Webster's Geographical Dictionary. Springfield, Mass. : Merriam-Webster. 1997. ISBN 978-0-87779-546-9. Retrieved 23 April 2011. "Water Resources in the Ganges River Basin". Louisiana School for Math, Science, and the Arts. Archived from the original on 26 October 2005. Rob, Md Abdur (2012). "Ganges-Padma River System". In Islam, Sirajul; Jamal, Ahmed A. (eds.). Banglapedia: National Encyclopedia of Bangladesh (Second ed.). Asiatic Society of Bangladesh.